Syracuse University is a private research university located in the heart of Central New York State. The main 270-acre campus positioned on University Hill overlooks the city of Syracuse. The beautiful quad surrounded by a mix of old and mid-century buildings is home to just under 15,000 undergraduates and close to 5,000 graduates from all over the world. Marshall Street serves as SU’s college town, just down the hill from the quad and essentially an extension of campus. At the other end of University Hill lies the Carrier Dome. 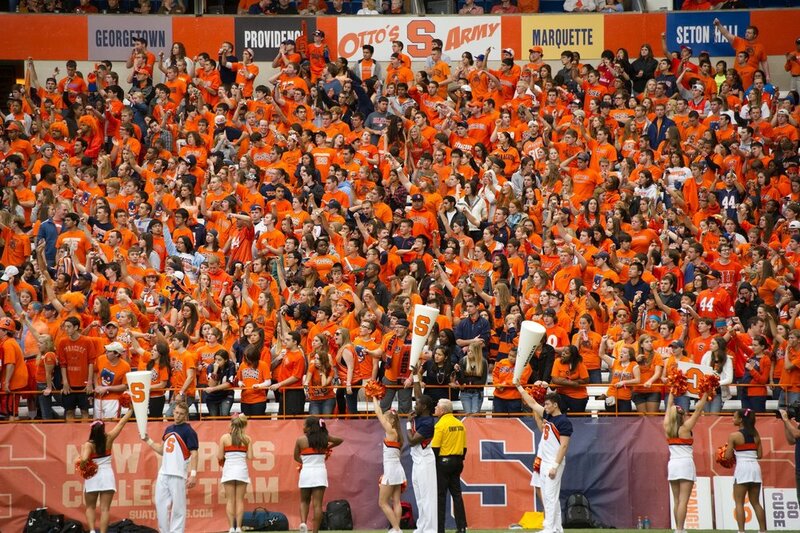 Try and plan your visit to coincide with a football or basketball game; Syracuse students have tons of school spirit, and it’s so much fun to experience Orange pride at one of the games. Transportation: The airport serving the Syracuse metropolitan area is Syracuse Hancock International Airport. Taxis are available at the airport. The William F. Walsh Regional Transportation Center (RTC) houses both the train and bus station. Amtrak, Greyhound, Trailways, and Megabus have services from Syracuse. Centro public buses run from campus to the Regional Transportation Center on a regular basis. Stay: You can’t get any closer than the Sheraton Syracuse University Hotel, located right on University Ave, convenient to both campus and Marshall Street. Make reservations early; rooms fill up quickly especially if there’s an event at the Carrier Dome. If it’s booked, the next best option is the Hotel Skyler, less than a five-minute walk from campus. Families and alums also recommend the Genesee Grande Hotel, another good choice. Formerly the Hotel Syracuse, the Marriott Downtown has been fully restored to its original 1924 glory, an excellent option in the heart of downtown, just a short drive to the university. Coffee: Known for the best coffee in Syracuse, Cafe Kubal has a location right on campus in the Marshall Square Mall, directly across from the Whitman Business School and the Sheraton. Starbucks has a prime corner spot on Marshall Street and is lively with students at all times of the day. There is a Dunkin Donuts in the Schine Student Center. Recess Coffee is another great option for coffee, five minutes away from campus. Breakfast: Students rave about Mother's Cupboard, known for their huge pancakes and cocoa iced coffee. If you have a car and some time, Stella's diner is the place to go. A favorite of locals as well as SU students, it's known to have the best hangover brunch in the area. You must order the home fries; you won't regret it, it's a meal in itself. Another great choice is Eggplant - also known as the "All Night Eggplant Diner." Lunch: Downtown’s Armory Square is a short 5- 10-minute drive from campus. Our lunch recommendations include Blue Tusk, Empire Brewery, and Modern Malt. The city’s new hot spot is Original Grain; students head here for a healthy fix enjoying trendy poke and grain bowls, salads and nori wraps. On campus at the crossroads of Marshall Street, Varsity is an institution at Syracuse beloved for over 80 years - famous for pizza and wings. Also on Marshall Street Faegan's, another SU icon serves bar/pub food items such as salads, sandwiches, and a wide selection of beers! Casual: Syracuse does not lack for good Mexican fare. Students frequent The Mission, Alto Cinco and their sister restaurant downtown, Otro. There are now eight locations of Dinosaur BBQ but it all began here in Syracuse. Get your fill of smoked meats with all the sides here or head across the street to Dinosaur’s new brick oven pizza restaurant Apizza Regionale, a new favorite in town. Kitty Hoynes in Armory Square is an Irish pub serving traditional Irish fare with a modern twist. A Step Up: Lemon Grass considered by many as Syracuse’s top table showcases Asian fusion at its best. Pastabilities is the oldest restaurant in Armory Square, serving Italian inspired plates to hungry students and locals alike. A must order is their famous spicy hot tomato oil served with homemade stretch bread. (Be prepared to wait, especially after the restaurant’s starring role on Diners, Drive In’s and Dives.) Other Italian choices include Asti, Joey’s and Francesca’s Cucina. Local favorites, Phoebe’s and The York are American bistros with seasonal menus. Sweets: Pay a visit to Syracuse’s favorite homemade ice cream shop, family run Gannon's open during the spring through fall. Insomnia Cookies satisfies any late night sugar craving. Views From a College Counselor: Stuart Nachbar of Educated Quest remarks on his recent visit to Syracuse: Syracuse University has several excellent academic programs, most notably in Architecture, Communications, Computer and Information Science, Entrepreneurship, Public Policy and the performing arts, among others. Unlike the flagship state universities in New York and neighboring states, Syracuse University allows students in virtually any major to minor in virtually any business or information sciences program. This makes it easy for liberal arts majors to build a skill set to complement their interests. This school is also more “spirit and sports” oriented than any private university in the Northeast or Mid-Atlantic states, hence my moniker, the “USC of the East.” Syracuse is the only private university in America that has won national championships in football, men’s basketball and lacrosse, the latter being the most dominant sport, with 10 national titles. To see Stuart’s full profile of Syracuse click here. Be sure to click on the extended profile link at the bottom of the page to see a comprehensive guide that includes facts on SAT and ACT mid ranges, comparable colleges, curriculum, the alumni network, safety on campus and costs—just to name a few. Local Attractions: Before leaving school stock up on your “Orange” gear at Mannys or T Shirt World. Explore Armory Square, the revitalized district downtown, where old warehouses and historic buildings are now home to a large concentration of restaurants, bars, and eclectic shops. The Everson Museum of Art, focusing on American artists, has an impressive collection housed in a building designed by acclaimed architect I.M. Pei. The picturesque town of Skaneateles, in the heart of the Finger Lakes region, is a half hour drive from SU. Stroll along Skaneateles Lake and enjoy the historic downtown filled with architectural treasures and great restaurants. Popular student recommendations include Gildas, Bluewater Grill, The Corner and Doug's Fish Fry to name a few! Enjoy an afternoon of hiking or biking on the extensive network of trails at Green Lakes State Park or just do a loop around the glacial lake. There's also an 18 hole Robert Trent Jones golf course. Just toured the Syracuse University Campus? Are you a Syracuse University student, parent or Alumni? Fill out this 2 minute survey to supplement our Daytripper University Guide for Syracuse University!